Scribbling depictions of glass can be hard. I've seen incredible works by artists whose glass, painted in watercolor or oil or acrylic, looks like you could pick it up from the paper and drink from it. That's not really my goal, since I'm a scribbler at heart. But I would like to learn to depict glass so that people could tell what it is! Below are three recent sketches of glass. Colored glass. First, a piece done with oil pastels. Here I had fun with the perspective and with my fellow scribbler in the background. Next, charcoal with some pastels on toned paper. Here I am particularly happy with the turn of the label around the three sides of the bottle. 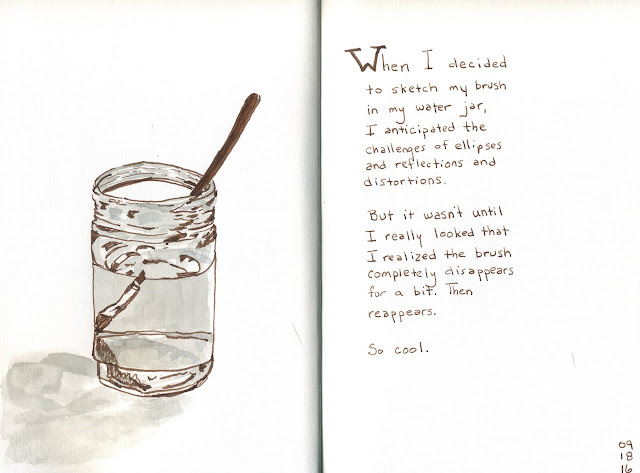 Finally, a jar of paint water, with a paint brush in it. Done in watercolor and with some journaling. Glass is transparent, much of it. And it's hard to think about noticing, seeing, depicting, what is, in a way, invisible. But of course, it isn't. Sometimes it is both colored and transparent. Sometimes it contains something colored. Sometimes it distorts what you see through it. Usually, light bounces off of it, revealing dips and turns. But like drawing dogs or trikes or most anything else, it all comes down to really looking. To forgetting what you think you see or expect to see and really perceiving what is going on before you. I think we all need to do a lot more of that these days. What is really going on in our world?